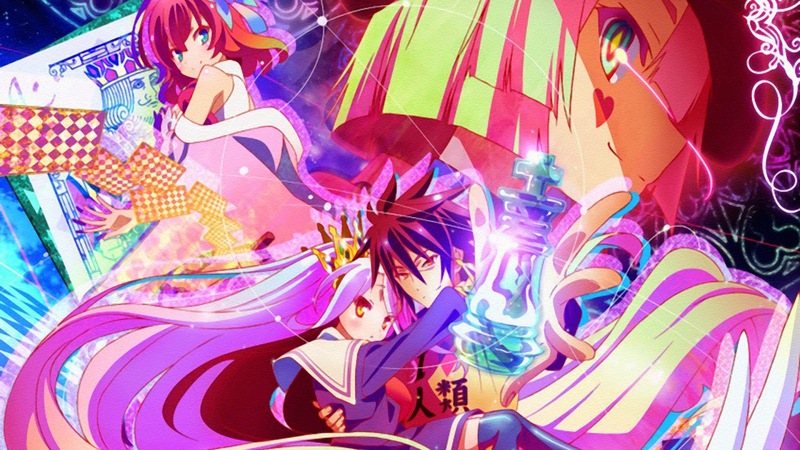 Much in the same way that Black Bullet was hyped because of Attack on Titan, I think No Game, No Life was hyped because of the success of Sword Art Online. Why? Well, for one thing Matsuoka Yoshitsugu is the star of each. However, No Game, No Life takes the exact opposite approach of Sword Art Online and Sora is just about as far from Kirito as you can get. Sora wants to be stuck in the game world forever with his younger step-sister Shiro so they can play games. They were brought to the world by the "God" named Tet for the primary purpose of making the world where everything is decided by games interesting. In real life, Sora and Shiro had been a dynamic duo of harcore gaming NEET (Not in employment, education, or training) hikikomori (shut-ins) and when they played games they were known by their codename "blank" because they never actually filled in a codename. Blank never lost a game in the real world and it is for that reason that Tet summoned them into the gaming world. Needless to say that Sora and Shiro consider this to be the best thing that ever happened to them. Hikasa Yoko (whom I completely forgot helped to traumatize me in Aku no Hana) also lends her voice to the helpless and hopeless Stephanie Dola, a member of the Imanity and granddaughter of the former King of Elkia. Yet somehow, despite being the "eye-candy character" she seems to be the smartest (or at least the most driven) of all of them. Elkia is in desperate need of a new king and the selection process for this king should be obvious: a game where all members of Imanity are welcome to play. Whoever makes it to the end of the selection process without losing will be crowned king unless someone else challenges him (or her) before that can happen. Like a marriage ceremony there's that part where anyone has a chance to object. Blank, who have never lost a game, consider this to be a perfect opportunity to test themselves. Of course, becoming the King(s) of Elkia isn't enough for Blank. Their ultimate goal is to challenge the God Tet to a game so that they can become God. This series is only 12 episodes so it will fly by, but unlike Black Bullet (which runs one episode longer) it doesn't feel like this series is forced. In fact, this series seems destined to have a sequel because it leaves so much room for more development and feels unfinished. Not everything was crammed into the 12 episodes and that feels refreshing. The jokes and references (of which there are plenty) sometimes seem to come at you at a million miles an hour, but that actually helps this series when it comes to re-watch value. More can be gotten out of it the second time this series is watched because will inevitably be that one thing no one else caught. I think I caught pretty much everything, but I must have not been paying attention to the Castle in the Sky reference. Of course, it should be noted that this series has plenty of fanservice, but none of it felt particularly overwhelming to me. In fact, a lot of it was rather creative in the way that they intentionally stepped around the censors by breaking the fourth wall. While certainly a modern day anime fan's anime, it also has a bit of intelligence to it that might attract fans who miss the days when an anime about games could be more than an advertisement for toys at Wal-Mart. It certainly won't become massive like Sword Art Online, but I imagine that it should make it's way to the states with a dub and a nice blu-ray set without too much hassle. The crossover appeal for this anime seems to be strong, though. I would certainly welcome a sequel series. P.S. 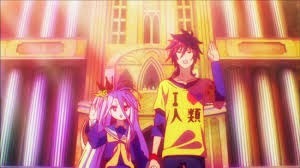 - I should also mention how much I loved the animation, too. I've been watching anime for a while now, but the way things were animated in this show really helped to separate it from the competition and that's something that just doesn't happen a lot these days.